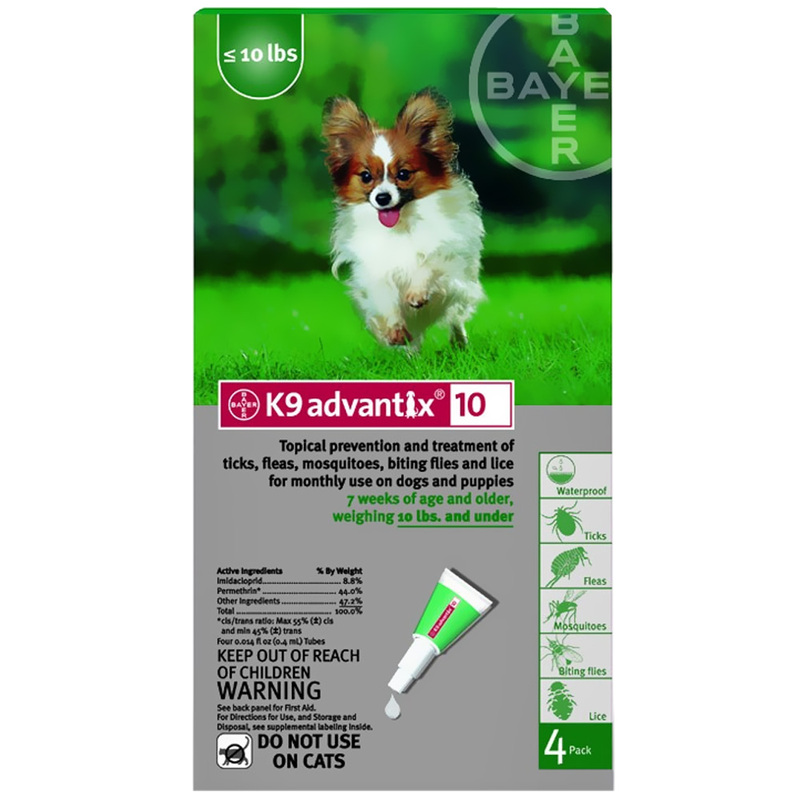 K 9 Advantix Green is a once-a-month topical tick, mosquito and flea treatment for dogs and puppies 7 weeks of age and older. It contains imidacloprid and permethrin. It also remains effective after swimming or bathing. This is the ultimate protection for your dog! Each packet contains 4 applications providing 4 months of protection. Effective Flea & Tick Control . . . No Prescription Required! CLICK HERE for additional information on K9-Advantix. Q: How long does K9 Advantix last? A: A single application of K9 Advantix keeps working for one month. Q: How often should customers use K9 Advantix? Q: My pet is strictly indoors. Should I still use Advantage? A: Yes, Ticks and fleas can be brought into the home by people or other pets without pet owners even realizing it. Immature flea stages remain dormant until conditions are appropriate for development and infest pets after hatching. That's why it is important to also protect indoor pets. Q: Can I bathe my pets during the month after application? A: Yes, you can give your dogs or cats a bath. We recommend a non-detergent shampoo for best results. Q: For what age pets can I use K9 Advantix on? A: K9 Advantix is gentle enough for puppies as young as 7 weeks.